On Dec 13, the Department of Veterans Affairs (VA) released a final rule granting full practice authority to three of the four established Advanced Practice Registered Nurses (APRNs) roles when they are acting within the scope of their VA employment. Nurse Practitioners (NPs), Clinical Nurse Specialists (CNSs) and Certified Nurse-Midwives (CNMs) will now have full practice authority within the VA Health System as a mechanism for extending veterans access to a full range of qualified health professionals. On June 13, 2018 Gov. Phil Murphy signed a package of six gun safety bills that make New Jersey among the states with the strongest and most formidable gun laws in the nation. In particular, there have been important expansions to our Duty to Warn and Protect laws. A2757 Requires background check for private gun sales. A2758 Codifies regulations defining justifiable need to carry handgun. In addition to the vibrant rally at the capitol, PCNP leaders were showcased on local news. The word is out about full practice authority and the "Time is now!" Section 303 of the Comprehensive Addiction and Recovery Act (CARA), signed into law by President Obama on July 22, 2016, made several changes to the law regarding office-based opioid addiction treatment with buprenorphine. CARA expands prescribing privileges to nurse practitioners (NPs) and physician assistants (PAs) for five years (until October 1, 2021). NPs and PAs must complete 24 hours of training to be eligible for a waiver to prescribe and must be supervised by or work in collaboration with a qualifying physician if required by state law. The HHS Secretary has 18 months to issue updated regulations governing office-based opioid addiction treatment to include NPs and PAs.ASAM's complete summary of CARA is available here. New Jersey is confronting a staggering public health crisis brought about by prescription opioid abuse. On February 15, 2017, P.L. 2017, c. 28, was signed into law, imposing certain restrictions on how opioids and other Schedule II controlled dangerous substances may be prescribed. In response to the new law, the Attorney General and New Jersey's prescribing boards adopted new rules designed to reduce the risk of addiction and the accumulation of opioids in the household medicine cabinets across the State, which are very often diverted for illegal use. Information about those rules, as well as guidance for prescribers and patients on safer pain medication prescribing practices is available here. 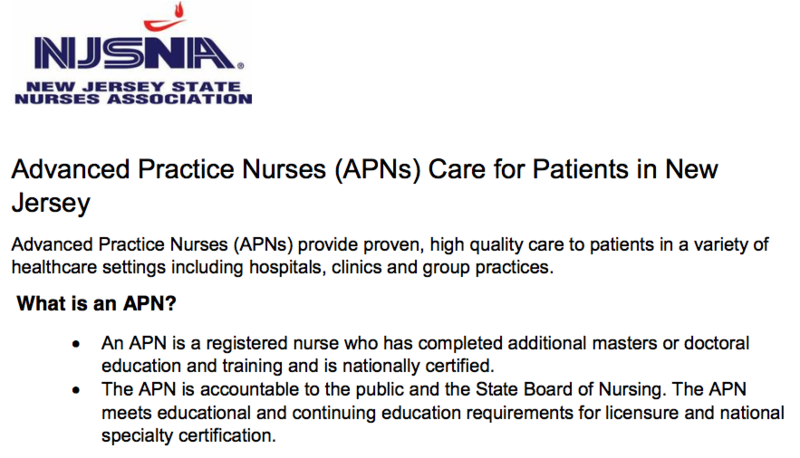 FREQUENTLY ASKED QUESTIONS: For Advance Practice Nurses Licensed by the Board of Nursing. State law makes it unlawful for a prescriber to issue an initial prescription for acute pain for more than a five-day supply. In addition, the dosage authorized by initial prescriptions for acute pain is to be limited to the lowest effective dose of an immediate–release opioid drug. To better understand how to comply with this limitation and other rule changes, the Board offers the following guidance. When it's time to RENEW YOUR MEMBERSHIP Don't delay! Click here to renew your annual membership now. Founded in 1972, SPAPN was the first professional nursing body in the country to certify clinical nurse specialists in psychiatric nursing. Today, the Society includes all psychiatric advanced practice nurses, both psychiatric nurse practitioners and clinical nurse specialists in advanced practice nursing. The Society continues to advocate and lobby for psychiatric advanced practice nurses in practicing to the fullest scope of their training and education, upholding the standards of excellence for psychiatric mental-health nursing and to promote the delivery of high quality professional care to clients, their families and the community.